I don’t speak a word of this language, so I’ve decided to just keep notes as I learn. There are hardly any widely available resources online, and I can’t get any texts or audio without ordering them by mail. If anyone speaks this language and would like to help me learn it, please leave a message here. I’ll start out by simply copying out and editing what I see as the relevant parts of some Wikipedia entries. The Southern Min languages, or Min Nan (闽南语 / 閩南語 / Mǐnnán yǔ; Pe̍h-ōe-jī: Bân-lâm-gí/Bân-lâm-gú), (“Southern Fujian” language) is a family of languages spoken in southern Fujian and its neighbouring regions, Taiwan, and by descendants of emigrants from these areas in diaspora. In common parlance, Southern Min usually refers to Hokkien, in particular Amoy and Taiwanese. Amoy and Taiwanese are both combinations of Quanzhou and Zhangzhou speech. The Southern Min family also includes Teochew and Hainanese. Teochew has limited mutual intelligibility with the Amoy. However, Hainanese is generally not considered to be mutually intelligible with any other Southern Min variants. A form of Southern Min akin to that spoken in southern Fujian is also spoken in Taiwan, where it has the native name of Tâi-oân-oē or Hō-ló-oē. The (sub)ethnic group for which Southern Min is considered a native language is known as the Holo (Hō-ló) or Hoklo, the main ethnicity of Taiwan. There are many Southern Min speakers also among overseas Chinese in Southeast Asia. Many ethnic Chinese emigrants to the region were Hoklo from southern Fujian, and brought the language to what is now Indonesia (the former Dutch East Indies) and present day Malaysia and Singapore (formerly Malaya, Burma, and the British Straits Settlements). In general, Southern Min from southern Fujian is known as Hokkien, Hokkienese, Fukien or Fookien in Southeast Asia, and is very much like Taiwanese. Many Southeast Asian ethnic Chinese also originated in the Chaoshan region of Guangdong province and speak Teochew, the variant of Southern Min from that region. Southern Min is reportedly the native language of up to 98.5% of the community of ethnic Chinese in the Philippines, among whom it is also known as Lan-nang or Lán-lâng-oē (“Our people’s language”). Southern Min speakers form the majority of Chinese in Singapore with the largest being Hoklos and the second largest being the Teochews. As Xiamen (Amoy) is the principal city of southern Fujian, the Xiamen dialect is considered the most important, or even prestige dialect. The Xiamen dialect is a hybrid of the Quanzhou and Zhangzhou dialects. The Xiamen dialect (also known as the Amoy dialect) has played an influential role in history, especially in the relations of Western nations with China, and was one of the most frequently learned of all Chinese languages/dialects by Westerners during the second half of the 19th century and the early 20th century. The variants of Southern Min spoken in Zhejiang province are most akin to that spoken in Quanzhou. The variants spoken in Taiwan are similar to the three Fujian variants, and are collectively known as Taiwanese. Taiwanese is used by a majority of the population and is quite important from a socio-political and cultural perspective, forming the second most important, if not the more influential pole of the language due to the popularity of Taiwanese Hokkien media. Those Southern Min variants that are collectively known as “Hokkien” in Southeast Asia also originate from these variants. The variants of Southern Min in the Chaoshan region of eastern Guangdong province are collectively known as Teochew or Chaozhou. Teochew is of great importance in the Southeast Asian Chinese diaspora, particularly in Malaysia, Philippines, Thailand, Cambodia, Vietnam, Sumatra and West Kalimantan. The Southern Min language variant spoken around Shanwei and Haifeng differs markedly from Teochew and may represent a later migration from Zhangzhou. Linguistically, it lies between Teochew and Amoy. In southwestern Fujian, the local variants in Longyan and Zhangping form a separate division of Min Nan on their own. Among ethnic Chinese inhabitants of Penang, Malaysia and Medan, Indonesia, a distinct form of Zhangzhou (Changchew) Hokkien has developed. In Penang, it is called Penang Hokkien while across the Malacca Strait in Medan, an almost identical variant is known as Medan Hokkien. The Southern Min language has one of the most diverse phonologies of Chinese variants, with more consonants than standard Mandarin or Cantonese. Vowels, on the other hand, are more or less similar to those of Standard Mandarin. In general, Southern Min dialects have five to six tones, and tone sandhi is extensive. There are minor variations within Hokkien. Xiamen speech is a hybrid of Quanzhou and Zhangzhou speech. Taiwanese is also a hybrid of Quanzhou and Zhangzhou speech. Taiwanese in northern Taiwan tends to be based on Quanzhou speech, whereas the Taiwanese spoken in southern Taiwan tends to be based on Zhangzhou speech. There are minor variations in pronunciation and vocabulary between Quanzhou and Zhangzhou speech. The grammar is basically the same. Additionally, Taiwanese includes several dozen loanwords from Japanese. The following table provides words that illustrate some of the more commonly seen vowel shifts. Characters with same vowel are shown in parentheses. Quanzhou speech, Xiamen (Amoy) speech, Zhangzhou speech and Taiwanese are mutually intelligible. Chaozhou (Teochew) speech and Amoy speech are 84.3% phonetically similar and 33.8% lexically similar, whereas Mandarin and Amoy Min Nan are 62% phonetically similar and 15.1% lexically similar. In comparison, German and English are 60% lexically similar. Southern Min dialects lack a standardized written language. Southern Min speakers are taught how to read Standard Mandarin in school. As a result, there has not been an urgent need to develop a writing system. In recent years, an increasing number of Southern Min Language speakers have become interested in developing a standard writing system (either by using Chinese characters, or using a romanized script). Hokkien includes a variety of dialects of which Amoy and Taiwanese prestige dialect (based on Tainan variant) are considered standards, being in the middle of dialectic divides and thus enjoying the highest intelligibility amongst the varying dialects. All variants of Hokkien dialects, be it Amoy, Taiwanese and those spoken in South East Asia, can be traced to two sources of origin: Quanzhou speech and Zhangzhou speech. Both Amoy and Taiwanese are based on a mixture of Quanzhou and Zhangzhou speeches, while the rest of the Hokkien dialects spoken in South East Asia are either derived from Quanzhou and Zhangzhou, or based on a mixture of both speeches. During the Three Kingdoms period of ancient China, there was constant warfare occurring in the Central Plain of China. Northerners began to enter into Fujian region. This caused Fujian region to have, besides the languages spoken by the native Yue peoples, parts of northern Chinese languages. However, the massive migration of northern Han Chinese into Fujian region mainly occurred after the Disaster of Yongjia. The Jìn court fled from the north to the south, causing large numbers of northern Han Chinese to move into Fujian region. They brought the old Chinese (spoken in Central Plain of China from prehistoric era to 3rd century AD) into Fujian region. This then gradually evolved into the Quanzhou speech. In 677 AD (during the reign of Emperor Gaozong of Tang), Chen Zheng (陳政), together with his son Chen Yuanguang (陳元光), led a military expedition to pacify the rebellion in Fujian. They settled in Zhangzhou and brought the Middle Chinese phonology of northern China during the 7th century into Zhangzhou; In 885 AD (during the reign of Emperor Xizong of Tang),　the two brothers, Wang Chao (王潮) and Wang Shenzhi (王審知), led a military expedition force to pacify the Huang Chao rebellion. They brought the Middle Chinese phonology of northern China of the 8th century into Zhangzhou. These two waves of migrations from the north generally brought the northern Middle Chinese languages into Fujian region. This then gradually evolved into the Zhangzhou speech. Chinese scholars of late Ming and Qing had systematically studied the Hokkien dialects of those times and compiled a number of Chinese linguistics books about Hokkien. This include The Phonology of Quanzhou speech (彙音妙悟) by Huang Qian (黃謙), The Phonology of common Zhangzhou speech (彙集雅俗通十五音) by Xie Xiulan (謝秀嵐) etc. Hokkien has one of the most diverse phonologies amongst Chinese languages, with more consonants than standard Mandarin or Cantonese. Vowels, on the other hand, are more or less similar to that of Standard Mandarin. Southern Min has aspirated, unaspirated as well as voiced consonant initials. This distinction makes Southern Min one of the harder dialects for non-native speakers to learn. For example, the words for opening and closing (khui (開) vs. kuiⁿ (關)) a door have the same vowel but differ only by aspiration of the initial and nasality of the vowel. In addition, Southern Min also has labial initial consonants such as m in m̄-sī (毋是) (meaning “is not”). Another example from Taiwanese is “boy” (cha-po·-kiáⁿ, 查埔囝) vs. “girl” (cha-bó·-kiáⁿ, 查某囝), which differ in the second syllable in consonant voicing and in tone. Unlike Mandarin, Southern Min retains all the final consonants of Middle Chinese. While Mandarin only preserves the n and ŋ finals, Southern Min also preserves the m, p, t and k finals and developed the ʔ (glottal stop). In general, Hokkien dialects have 7 to 9 tones tones, and tone sandhi is extensive. There are minor variations between the Tsuan-Tsiu and Tsiang-Tsiu tone systems. Taiwanese tones follow the schemes of Amoy or Tsuan-Tsiu, depending on the area of Taiwan. Both Amoy and Taiwanese Hokkien typically has 7 tones; the 9th tone is used only in special or foreign loan words. Tsuan-Tsiu is the only Hokkien dialect with 8 tones, of which 6th tone is present. Amoy speech (Xiamen) is a hybrid of Chinchew (Quanzhou) and Changchew (Zhangzhou) speech. Taiwanese is also a hybrid of these two dialects. Taiwanese in northern Taiwan tends to be based on Chinchew speech, whereas the Taiwanese spoken in southern Taiwan tends to be based on Changchew speech. There are minor variations in pronunciation and vocabulary between Chinchew and Changchew speech. The grammar is basically the same. Additionally, Taiwanese includes several dozen loanwords from Japanese. On the other hand, the variants spoken in Singapore and Malaysia have a substantial number of loanwords from Malay and to a lesser extent, from English and other languages. Spoken: Chinchew (Quanzhou) speech, Xiamen (Amoy) speech, Changchew (Zhangzhou) speech and Taiwanese are mutually intelligible. Like most ethnic Chinese, whether from mainland China, Taiwan, Singapore, or other parts of Southeast Asia, Hokkien speakers write their language with Chinese characters. Hence, the inventory used for Mandarin is not a complete match for Hokkien, and there are a number of informal characters which are unique to Hokkien (as is the case with Cantonese). Where standard Chinese characters are used, they are not always etymological or genetic; the borrowing of similar-sounding or similar-meaning characters is a common practice. However, unlike Cantonese, Hokkien does not have a standardized character set and thus there is some variation in the characters used to express certain words. In 2007, the Ministry of Education of the Republic of China (Taiwan) has formulated and released a standard character set to overcome these difficulties. These standard Chinese characters for writing Taiwanese Hokkien are now taught in schools in Taiwan. Hokkien, especially Taiwanese, is sometimes transcribed with the Latin alphabet using one of several Romanized orthographies. Of these the most popular is Pe̍h-ōe-jī (traditional Chinese: 白話字; simplified Chinese: 白话字; pinyin: Báihuàzì). POJ was developed first by Presbyterian missionaries in China and later by the indigenous Presbyterian Church in Taiwan; use of the orthography has been actively promoted since the late 19th century. The use of a mixed orthography of Han characters and romanization is also seen, though remains uncommon. Other Latin-based orthographies also exist. Minnan texts, all Hokkien, can be dated back to the 16th century. One example is the “Doctrina Christiana en letra y lengua china,” presumably written after 1587 by the Spanish Dominicans in the Philippines. Another is a Ming Dynasty script of a play called Romance of the Lychee Mirror (1566 AD), supposedly the earliest Southern Min colloquial text. Xiamen University has also developed a romanisation system based on Pinyin, which has been published in a dictionary (Minnan Fangyan – Putonghua Cidian 閩南方言普通話詞典) and a language teaching book, which is used to teach the language to foreigners and Chinese non-speakers. This system known as Pumindian. Taiwan has also developed a romanization system for Taiwanese Hokkien derived from Pe̍h-ōe-jī. It is known as Tai-lo and since 2006 has been officially promoted by Taiwan’s Ministry of Education and taught in Taiwanese schools. Hokkien is registered as “Southern Min” per RFC 3066 as zh-min-nan. When writing Hokkien in Chinese characters, some writers create ‘new’ characters when they consider it impossible to use directly or borrow existing ones; this corresponds to similar practices in character usage in Cantonese, Vietnamese chữ nôm, Korean hanja and Japanese kanji. These are usually not encoded in Unicode (or the corresponding ISO/IEC 10646: Universal Character Set), thus creating problems in computer processing. After the Opium War in 1842, Xiamen (Amoy) became one of the major treaty ports to be opened for trade with the outside world. From mid 19th century onwards, Xiamen slowly developed to become the political, economical and cultural center of the Hokkien-speaking region in China. This caused Amoy dialect to gradually become the “Prestige Standard Hokkien”, thus replacing the position of dialect variants from Quanzhou and Zhangzhou. Up to today, it is still being regarded as the representative Standard Hokkien dialect. From mid 19th century till the end of World War II, western diplomats usually learned Amoy Hokkien as the preferred dialect if they were to communicate with the Hokkien-speaking populace in China or South-East Asia. In the 1940s and 1950s, Taiwan also held Amoy Hokkien as its standard. However, from 1980s onwards, the development of Hokkien entertainment and media industry in Taiwan caused the Hokkien cultural hub to shift from Xiamen to Taiwan. The flourishing Hokkien entertainment and media industry from Taiwan in the 1990s and early 21st century led Taiwan to emerge as the new significant cultural hub for Hokkien. In 1990s, marked by the liberalization of language development and mother tongue movement in Taiwan, Taiwanese Hokkien had undergone a fast pace in its development. In 1993, Taiwan became the first region in the world to implement the teaching of Taiwanese Hokkien in Taiwanese schools. In 2001, the local Taiwanese language program was further extended to all schools in Taiwan, and Taiwanese Hokkien became one of the compulsory local Taiwanese languages to be learned in schools. The mother tongue movement in Taiwan even influenced Xiamen (Amoy) to the point that in 2010, Xiamen also began to implement the teaching of Hokkien dialect in its schools. In 2007, the Ministry of Education in Taiwan also completed the standardization of Chinese characters used for writing Hokkien and developed Tai-lo as the standard Hokkien pronunciation and romanization guide. A number of universities in Taiwan also offer Hokkien degree courses for training Hokkien language talents to work for the Hokkien media industry and education. Taiwan also has its own Hokkien literary and cultural circles whereby Hokkien poets and writers compose poetry or literature in Hokkien on a regular basis. Thus by the 21st century, Taiwan has truly emerged as one of the most significant Hokkien cultural hub of the world. Although Amoy Hokkien continued to be regarded as the historical “Prestige Standard Hokkien”, the historical changes and development in Taiwan had led Taiwanese Hokkien to become the more influential pole of the Hokkien dialect after mid 20th century. Today, Taiwanese prestige dialect (Taiyu Youshiqiang/Tongxinqiang 台語優勢腔/通行腔), which is based on Tainan variant and heard on Taiwanese Hokkien media, has also become one of the major “Standard Hokkien” along with Amoy. Amoy (Xiamen) is a Hokkien dialect which originally comes from Southern Fujian province (in Southeast China), in the area centered around the city of Xiamen. It is highly similar to Taiwanese, and is widely known as Hokkien in Southeast Asia. Amoy is widely considered to be the prestige dialect within Hokkien and Min Nan in general. For this reason, Amoy is often simply called Hokkien or Min Nan. In 1842, as a result of the signing of the Treaty of Nanking, Xiamen (Amoy) was designated as a trading port. Xiamen and Gulangyu islands rapidly developed, which resulted in a large influx of people from neighboring areas such as Quanzhou and Zhangzhou. The mixture of these various accents have formed the basis for Amoy. Over the last several centuries, there have been a large number of descendents from these areas who have migrated to Taiwan. Eventually, Amoy became popularly known as Taiwanese among the locals living there. Just like British and American English, there are subtle lexical and phonologic differences between Taiwanese and Amoy, however these differences do not generally pose any barriers to communication. Amoy speakers also spread to Southeast Asia, where it became widely known as Hokkien. Spoken Amoy preserves many of the sounds and words from Middle Chinese. However, the vocabulary of Amoy was also influenced in its early stages by the languages of the Minyue peoples. Spoken Amoy is known for its extensive use of nasalization. A comparison between Amoy and other Minnan dialects can be found there. Amoy is similar to other Min Nan dialects in that it makes use of 5-8 tones, though only two in checked syllables. The tones are traditionally numbered from 1 through 8, with 4 and 8 being the checked tones, but those numbered 2 and 6 are identical in most regions. Like other varieties of Min Nan, Amoy has complex rules for literary and vernacular readings of Chinese characters. For example, the character for big 大 has a vernacular reading of tōa ([tua˧]), but a literary reading of tāi ([tai˧]). Because of the loose nature of the rules governing when to use a given pronunciation, a learner of the language must often simply memorize the appropriate reading for a word on a case by case basis. For single syllable words, it is more common to use the vernacular pronunciation. This situation is comparable to the on and kun readings of Japanese. The Swadesh word list, developed by the linguist Morris Swadesh, is used as a tool to study the evolution of languages. It contains a set of basic words which can be found in every language. Amoy grammar shares a similar structure to other Chinese dialects, although it is slightly more complex than Standard Mandarin. Moreover, equivalent Amoy and Mandarin particles are usually not cognates. As the following example shows, Amoy complement constructions are roughly parallel to Standard Mandarin, with some exceptions (in red). i m̄-sī gún lāu-bú. She is not my mother. i m̄ lâi. He does not come./He will not come. góa khòaⁿ-bē-tio̍h. I am not able to see it. i bē-hiáu kóng Eng-gú. He can’t speak English. i bô beh lâi. He is not going to come. i bô chîⁿ. He does not have any money. i bô lâi. He did not come. i bô súi. She is not beautiful. An exception can be made for hó (good), m̄-hó = bô-hó – not good. A number of Romanization schemes have been devised for Amoy. Pe̍h-ōe-jī is one of the oldest and best established. However, the Taiwanese Language Phonetic Alphabet has become the Romanization of choice for many of the recent textbooks and dictionaries from Taiwan. ^ “The Ancient Minyue People and the Origins of the Min Nan Language” (in Mandarin). Jinjiang Government website. http://www.jinjiang.gov.cn/lhzzfw/wyzc/mjgs/20060420801280.shtml. Retrieved 2008-04-12. (in Mandarin/Taiwanese) To understand the beauty of Taiwanese (愛說台語五千年 — 台語聲韻之美). ISBN 9789867101471. (in Mandarin/Taiwanese/English) A vocabulary and sentence structure comparison between Mandarin, Taiwanese and English (華台英詞彙句式對照集). ISBN 9571138223. (in Mandarin/Min Nan/English) Papers on Southern Min Syntax (閩南語語法研究試論). ISBN 9571509485. Taiwanese Hokkien (臺灣閩南語), commonly known as Taiwanese (Tâi-oân-oē 臺灣話 or Tâi-gí 台語), is the Hokkien dialect of Min Nan as spoken by about 70% of the population of Taiwan. The largest ethnic group in Taiwan, for which Hokkien is considered a native language, is known as Hoklo or Holo (Hō-ló). The correspondence between language and ethnicity is generally true though not absolute, as some Hoklo speak Hokkien poorly while some non-Hoklo speak Hokkien fluently. Pe̍h-oē-jī (POJ) is a popular orthography for this language, and for Hokkien in general. Taiwanese Hokkien is generally similar to Amoy. Minor differences only occur in terms of vocabulary. Like Amoy, Taiwanese Hokkien is based on a mixture of Zhangzhou and Quanzhou speech. Due to the mass popularity of Hokkien entertainment media from Taiwan, Taiwanese Hokkien has grown to become the more influential Hokkien dialect of Min Nan, especially after 1980s. Along with Amoy, the Taiwanese prestige dialect (based on the Tâi-lâm variant) is regarded as ‘standard Hokkien’. Taiwanese Hokkien is a variant of Min Nan, closely related to the Amoy dialect. It is often seen as a Chinese dialect within the larger Sinitic language family. On the other hand, it may also be seen as an independent language since it is not mutually intelligible with Mandarin. Since the pronunciation of words is different, a Mandarin speaker needs to use the writing system of Chinese characters to communicate with a Hokkien speaker. Min is the only branch of Chinese that cannot be directly derived from Middle Chinese. This may account for the difficulty in finding the appropriate Chinese characters for some Min Nan vocabulary. There is both a colloquial version and a literary version of Taiwanese Hokkien. Spoken Taiwanese Hokkien is almost identical to spoken Amoy Hokkien. Regional variations within Taiwanese may be traced back to Hokkien variants spoken in Southern Fujian (Quanzhou and Zhangzhou). Taiwanese Hokkien also contains loanwords from Japanese and the Formosan languages. Recent work by scholars such as Ekki Lu, Sakai Toru, and Lí Khîn-hoāⁿ (also known as Tavokan Khîn-hoāⁿ or Chin-An Li), based on former research by scholars such as Ông Io̍k-tek, has gone so far as to associate part of the basic vocabulary of the colloquial Taiwanese with the Austronesian and Tai language families; however, such claims are controversial. A literary form of Minnan once flourished in Fujian and was brought to Taiwan by early emigrants. Tale of the Lychee Mirror (Nāi-kèng-kì), a manuscript for a series of plays published during the Ming Dynasty in 1566, is one of the earliest known works. This form of the language is now largely extinct. During Yuan dynasty, Quanzhou became a major international port for trade with the outside world. From that period onwards, due to political and economic reasons, many people from regions of Min Nan (southern Fujian) started to emigrate overseas. This included the undeveloped Taiwan. They brought with them their native mother tongue Hokkien. During late Ming dynasty, due to political chaos, there were increasing migrations from southern Fujian and eastern Guangdong to Taiwan. The earliest immigrants who were involved in the land development of Taiwan included Yan Siqi (顏思齊) and Zheng Zhilong (鄭芝龍). In AD 1622, Yan Siqi and his forces occupied Bengang 笨港 (today’s Beigang town 北港鎮 in Yunling county) and started to develop Zhuluoshan 諸羅山 (today’s Chiayi city). After the death of Yan, his power was inherited by Zheng Zhilong and he ruled the Straits of Taiwan. In 1628, Zheng Zhilong accepted the bureaucratic rule by Ming court. During the reign of Chongzhen Emperor, there were frequent droughts in the Fujian region. Zheng Zhilong suggested to Xiong Wenchan 熊文燦 (governor of Fujian) to mass tens of thousands of people and to give each person 3 taels and three persons one buffalo, in order to attract them to go to Taiwan to develop the agriculture in Taiwan. Although there were many people who returned home after the development, a portion of the people settled down permanently in Taiwan. They also traded and intermarried with many Taiwanese aborigines (in particular the Siraya_people) and propagated the Hokkien dialect around Taiwan. In AD 1624 and AD 1626, the Dutch and Spanish dispatched large forces to occupied Tainan and Keelung respectively. During the 40 years of Dutch colonial rule of Taiwan, many Han-Chinese from Quanzhou, Zhangzhou and Hakka regions of mainland China were recruited to help develop Taiwan. Because of intermingling with Siraya_people as well as Dutch colonial rule, the Hokkien dialects started to deviate from the original Hokkien spoken in mainland China. In 1661, Koxinga dispatched a large troop to attack Taiwan. He managed to conquer Taiwan and establish the Koxinga dynasty. Koxinga originated from Quanzhou. Chen Yonghua 陳永華, who was in charge of establishing the education system of Koxinga dynasty, also originated from Quanzhou. Because most of the soldiers he brought to Taiwan came from Quanzhou, Taiwan had once held Quanzhou Hokkien as its prestige dialect during that time. In 1683, Shi Lang attacked Taiwan and caused the Koxinga dynasty to collapse. The Qing dynasty officially began to rule Taiwan. In the following years, in order to prevent people from rebelling against Qing, the court of Qing instituted the ban on migration to Taiwan, esp. the migration of Hakka people from Guangdong province. This caused the migration of Hakka people to Taiwan to stop and led Hokkien to become a prestige language in Taiwan. During the reign of Yongzheng Emperor and Qianlong Emperor, the restriction began to be relaxed. In 1874, the ban on emigration to Taiwan was removed. In this place, the language is as birdcall – totally unintelligible! For example: for the surname Liú, they say ‘Lâu’; for Chén, ‘Tân’; Zhuāng, ‘Chng’; and Zhāng is ‘Tioⁿ’. My deputy’s surname Wú becomes ‘Ngô͘’. My surname Huáng does not even have a proper vowel: it is ‘N̂g’ here! It is difficult to make sense of this. This set the tone for the uneasy relationship between this language community and the colonial establishments in the next few centuries. In the 18th and 19th centuries, civil unrest and armed conflicts were frequent in Taiwan. In addition to resistance against the government (both Chinese and Japanese), battles between ethnic groups were also significant: the belligerent usually grouped around the language they use. History recorded battles between the Hakka and the Taiwanese-language speakers; between these and the Taiwanese Aborigines; and between those who spoke the Choâⁿ-chiu variant of what became the Taiwanese language and those who spoke the Chiang-chiu variant. During the 200 years of Qing dynasty‘s rule of Taiwan, Min Nan people who migrated to Taiwan began to increase rapidly. In particular, most of them came from Quanzhou and Zhangzhou. With increasing migration, the Hokkien dialect was also spreaded to every part of Taiwan. Although there was a conflict between Quanzhou and Zhangzhou people in Taiwan historically, the intermingling of Quanzhou and Zhangzhou people caused the two Hokkien accents to be mixed together. Apart from Yilan and Lugang, which still preserve the pure original Hokkien accent, every region of Taiwan speak a variant of Hokkien based on a mixture of Quanzhou and Zhangzhou Hokkien. Scholar such as Ang Ui-jin called Taiwanese Hokkien “Zhang Quan lan 漳泉濫“, meaning that Taiwanese Hokkien is based on a mix or combination of both Quanzhou and Zhangzhou Hokkien. After 1842, Amoy became an important port in mainland China and became the only port opened for trade in the Min Nan region. Amoy Hokkien was also formed from a mix of Quanzhou and Zhangzhou Hokkien, and gradually replaced Quanzhou Hokkien as the prestige dialect. During the Japanese colonial rule of Taiwan, Taiwan began to hold Amoy Hokkien as its standard pronunciation and was known as Taiwanese by the Japanese. However, after 1945, Amoy Hokkien and Taiwanese Hokkien began to have some minor differences due to different development and evolution in the two languages. Later, in the 20th century, the conceptualization of Taiwanese is more controversial than most variations of Chinese because at one time it marked a clear division between the Mainlanders who arrived in 1949 and the pre-existing majority native Taiwanese. Although the political and linguistic divisions between the two groups have blurred considerably, the political issues surrounding Taiwanese have been more controversial and sensitive than for other variants of Chinese. After the First Sino-Japanese War, due to military defeat to the Japanese, the Qing dynasty ceded Taiwan to Japan, causing the contacts with the Min Nan regions of mainland China to stop. During the Japanese colonial rule, Japanese language became an official language in Taiwan. Taiwanese Hokkien began to absorb large number of Japanese loan words into its language. Examples of Japanese loan words used in Taiwanese include 「便所」（piān-só·） for “toilet”, 「坪」（pêⁿ） for “units of land”, 「ガス，Gas」 for “gas”, 「オートバイ，Autobike」 for “autobike”. All of these caused Taiwanese to deviate from Hokkien in mainland China. During the Kōminka of the late Japanese colonial period, the Japanese language was widely used in Taiwan. Only after 1945 did Taiwanese Hokkien began to be revived. Taiwanese Hokkien began to become only a colloquial tongue, and most Taiwanese are unable to read out Chinese poetry or Classical Chinese in Taiwanese. After the government of Republic of China regained control of Taiwan, there was once some cultural exchange with mainland China. However, the Chinese Civil War caused the political separation between mainland China and Taiwan. The Kuomingtang government retreated to Taiwan after being defeated during the war. This caused the population of Taiwan to increase from 6 million to 8 million. From then onwards, the government began to promote Standard Mandarin and ban the use of Taiwanese and other dialects in the public. Only after the lifting of martial laws in 1987 and mother tongue movement in the 1990s did Taiwan see a true revival in the Taiwanese language. Today, there were also large number of Taiwanese scholars dedicated to researching the language. The history of Taiwanese and the interaction with Mandarin is complex and at times controversial. Even the name is somewhat controversial. Some dislike the name Taiwanese as they feel that it belittles other variants such as Mandarin, Hakka, and the aboriginal languages which are spoken on Taiwan. Others prefer the name Min-nan or Hokkien as this views Taiwanese as a variant of the speech which is spoken on Fujian province in Mainland China. Others dislike the name Min-nan and Hokkien for precisely the same reason. One can get into similar controversial debates as to whether Taiwanese is a language or a dialect. Phonologically, Min Nan is a tonal language with extensive tone sandhi rules. Syllables consist maximally of an initial consonant, a vowel, a final consonant, and a tone; any or all of the consonants or vowels may be nasal. Unlike many other varieties of Chinese such as Standard Mandarin or Standard Cantonese, there are no native labiodental phonemes. The voiced plosives (/b/ and /ɡ/) become the corresponding fricatives ([β] and [ɣ]) in some phonetic contexts. H represents a glottal stop /ʔ/ at the end of a syllable. 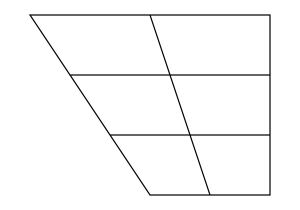 The vowel ⟨o⟩ is akin to a schwa; in contrast, ⟨o͘⟩ is more open. In addition, there are several diphthongs and triphthongs (for example, ⟨iau⟩). The consonants ⟨m⟩ and ⟨ng⟩ can function as a syllabic nucleus and are therefore included here as vowels. The vowels may be either plain or nasal: ⟨a⟩ is non-nasal, and ⟨aⁿ⟩ is the same vowel with concurrent nasal articulation. This is similar to French, Portuguese, and many other languages. There are two pronunciations of vowel ⟨o⟩. It is [ɤ] in Southern Taiwan mainly such as Tainan and Kaohsiung, and [o] in Northern Taiwan such as Taipei. But because of people moving and the development of communication, these two pronunciations are common and acceptable throughout the entire island. Demonstration of the tones of Taiwanese: saⁿ té khò͘ khoah lâng é phīⁿ ti̍t. Tone sandhi rules do not apply in this sentence. See (for one example) Wi-vun Taiffalo Chiung’s modern phonological analysis in the References, which challenges these notions. Tone number 0, typically written with a double dash ⟨–⟩ before the syllable with this tone, is used to mark enclitics denoting the extent of a verb action, the end of a noun phrase, etc. A frequent use of this tone is to denote a question, such as in “Chia̍h-pá–bē?”, literally meaning ‘Have you eaten yet?’. This is realized by speaking the syllable with either a low-falling tone (3) or a low stop (4). The syllable prior to the ⟨–⟩ maintains its original tone. A syllable requires a vowel (or diphthong or triphthong) to appear in the middle. All consonants can appear at the initial position. The consonants ⟨p, t, k⟩ and ⟨m, n, ng⟩ (and some consider ⟨h⟩) may appear at the end of a syllable. Therefore, it is possible to have syllables such as ⟨ngiau⟩ (“(to) itch”) and ⟨thng⟩ (“soup”). Incidentally, both of these example syllables are nasal: the first has a nasal initial consonant; the second a nasal vowel. Compare with hangul. See the work by Tiuⁿ Jū-hông and Wi-vun Taiffalo Chiung in the References, and the work by Robert L. Cheng (Tēⁿ Liông-úi) of the University of Hawaii, for modern linguistic approaches to tones and tone sandhi in Taiwanese. Modern linguistic studies (by Robert L. Cheng and Chin-An Li, for example) estimate that most (75% to 90%) Taiwanese words have cognates in other Chinese languages. False friends do exist; for example, cháu means “to run” in Taiwanese, whereas the Mandarin cognate, zǒu, means “to walk”. Moreover, cognates may have different lexical categories; for example, the morpheme phīⁿ means not only “nose” (a noun, as in Mandarin bí) but also “to smell” (a verb, unlike Mandarin). Among the apparently cognate-less words are many basic words with properties that contrast with similar-meaning words of pan-Chinese derivation. Often the former group lacks a standard Han character, and the words are variously considered colloquial, intimate, vulgar, uncultured, or more concrete in meaning than the pan-Chinese synonym. Some examples: lâng (person, concrete) vs. jîn (人, person, abstract); cha-bó͘ (woman) vs. lú-jîn (女人, woman, literary). Unlike the English Germanic/Latin contrast, however, the two groups of Taiwanese words cannot be as strongly attributed to the influences of two disparate linguistic sources. Extensive contact with the Japanese language has left a legacy of Japanese loanwords. Although a very small percentage of the vocabulary, their usage tends to be high-frequency because of their relevance to modern society and popular culture. Examples are: o͘-tó͘-bái (from オートバイ ootobai “autobike“, an “Engrish” word) and pháng (from パン pan “bread“, which is itself a loanword from Portuguese). Grammatical particles borrowed from Japanese, notably te̍k (from teki 的) and ka (from か), show up in the Taiwanese of older speakers. Whereas Mandarin attaches a syllabic suffix to the singular pronoun to make a collective form, Taiwanese pronouns are collectivized through nasalization. For example, i (he/she/it) and goá (I) become in (they) and goán (we), respectively. The -n thus represents a subsyllabic morpheme. Like all other Chinese languages, Taiwanese does not have true plurals. Unlike English, Taiwanese has two first-person plural pronouns. This distinction is called inclusive, which includes the addressee, and exclusive, which excludes the addressee. Thus, goán means we excluding you, while lán means we including you (similar to pluralis auctoris). The inclusive lán may be used to express politeness or solidarity, as in the example of a speaker asking a stranger “Where do we live?”, but meaning “Where do you live?”. The grammar of Taiwanese is similar to southern Chinese languages such as Hakka and Cantonese. The sequence ‘subject verb object’ is typical as in, for example, Mandarin, but ‘subject object verb’ or the passive voice (with the sequence ‘object subject verb’) is possible with particles. Take a simple sentence for example: ‘I hold you.’ The words involved are: goá (‘I’ or ‘me’), phō (‘to hold’), lí (‘you’). Subject kā object verb: Another sentence of roughly equivalent meaning is Goá kā lí phō, with the slight connotation of ‘I take you and hold’ or ‘I get to you and hold’. Object hō͘ subject verb (the passive voice): Then, Lí hō͘ goá phō means the same thing but in the passive voice, with the connotation of ‘You allow yourself to be held by me’ or ‘You make yourself available for my holding’. This article can only give a few very simple examples on grammar, for flavour. Linguistic work on the syntax of Taiwanese is still a (quite nascent) scholarly topic being explored. Taiwanese does not have a strong written tradition. Until the late 19th century, Taiwanese speakers wrote solely in literary Chinese. A system of writing Taiwanese using Latin characters called pe̍h-oē-jī (POJ) was developed in the 19th century. (For additional romanized systems, see references in “Orthography in Latin characters”, below.) Nonetheless, Taiwanese speakers nowadays most commonly write in vernacular Chinese, which uses the vocabulary and grammar of Mandarin, though Chinese characters are also used to represent spoken Taiwanese in writing. In most cases, Taiwanese speakers write using the script called Han characters as in Mandarin, although there are a number of special characters which are unique to Taiwanese and which are sometimes used in informal writing. Where Han characters are used, they are not always etymological or genetic; the borrowing of similar-sounding or similar-meaning characters is a common practice. Mandarin-Taiwanese bilingual speakers sometimes attempt to represent the sounds by adopting similar-sounding Mandarin Han characters. For example, the Han characters of the vulgar slang ‘khoàⁿ siáⁿ siâu’ (看三小, substituted for the etymologically correct 看啥痟, meaning ‘What the hell are you looking at?’) has very little meaning in Mandarin and may not be readily understood by a Taiwanese monolingual, as knowledge of Mandarin character readings is required to fully decipher it. In 2007, the Ministry of Education in Taiwan standardized the Han characters used for writing Taiwanese and implemented the teaching of them in school. With increasing literacy in Taiwanese, there are currently more Taiwanese online bloggers who write Taiwanese Hokkien online using these standardized Chinese characters. Han characters are also used by Taiwan’s Hokkien literary circle for Hokkien poets and writers to write literature or poetry in Taiwanese Hokkien. In some situations, Taiwanese is written with the Latin alphabet using an orthography called pe̍h-oē-jī (POJ), meaning ‘vernacular writing’. POJ was developed first by Presbyterian missionaries and later by the indigenous Presbyterian Church in Taiwan; they have been active in promoting the language since the late 19th century. Recently there has been an increase in texts using a mixed orthography of Han characters and romanization, although these texts remain uncommon. Other Latin-based orthographies exist, the most significant being Taiwanese Language Phonetic Alphabet (TLPA), Daighi tongiong pingim (DT), Ganvsig daiuuan bhanlam ghiw tongiong pingimv (GDT), Modern Literal Taiwanese (MLT), Simplified MLT (SMLT), Phofsit Daibuun (PSDB), and Tâi-ôan Lô-má-jī (see below). GDT, MLT, SMLT and PSDB employ tonal spelling to indicate tone without use of diacritic symbols, but alphabets instead. Twenty-four in all, including the obsolete ts, which was used to represent the modern ch at some places. The additional necessities are the nasal symbol ⁿ (superscript n; the uppercase form N is sometimes used in all caps texts, such as book titles or section headings), and the tonal diacritics. In 2006, the National Languages Committee (Ministry of Education, Republic of China) proposed a scheme called ‘Tâi-ôan Lô-má-jī’ (‘Tâi-lô’, literally ‘romanized orthography for Taiwanese’). This scheme reconciles the two of the more senior orthographies, TLPA and POJ. The changes for the consonants involved using ‘ts’ for POJ’s ‘ch’ (reverting to the orthography in the 19th century), and ‘tsh’ for ‘chh’. For the vowels, ‘o͘’ could optionally represented as ‘oo’. The nasal mark ‘ⁿ’ could also be represented optionally as ‘nn’. The rest of the scheme, most notably the use of diacritics to mark the tones, appeared to keep to the POJ tradition. One of the aims of this compromise was to curb any increase of ‘market share’ for Daighi tongiong pingim/Tongyong Pinyin. It is unclear whether the community will adopt this new agreement. The language Min-nan is registered per RFC 3066 as zh-min-nan. Taiwanese can be represented as ‘zh-min-nan-TW’. Prior to June 2004, the vowel [ɔ] akin to but more open than o, written with a ‘dot above right’, was not encoded. The usual workaround was to use the (stand-alone; spacing) character ‘middle dot’ (U+00B7, ·) or less commonly the combining character ‘dot above’ (U+0307). As these are far from ideal, since 1997 proposals have been submitted to the ISO/IEC working group in charge of ISO/IEC 10646 – namely, ISO/IEC JTC1/SC2/WG2 – to encode a new combining character ‘dot above right’. This is now officially assigned to U+0358 (see documents N1593, N2507, N2628, N2699, and N2770). Font support has followed: for example, in Charis SIL. Within the wider Hokkien speaking community in Southeast Asia, Ē-mn̂g (Amoy or Xiamen) is historically the variant of prestige, with other major variants from Choâⁿ-chiu/Choân-chiu (Chinchew or Quanzhou in Fujian) and Chiang-chiu (Changchew or Zhangzhou in Fujian). Another Min Nan language, Tiô-chiu (Teochew or Chaozhou in eastern Guangdong) is also widely spoken in these regions. In Taiwan, however, the Tâi-lâm (Tainan, southern Taiwan) speech is the variant of prestige, and the other major variants are the northern speech, the central speech (near Taichung and the port town of Lo̍k-káng in Changhua County), and the northern (northeastern) coastal speech (dominant in Gî-lân). The distinguishing feature of the coastal speech is the use of the vowel ‘uiⁿ’ in place of ‘ng’. The northern speech is distinguished by the absence of the 8th tone, and some vowel exchanges (for example, ‘i’ and ‘u’, ‘e’ and ‘oe’). The central speech has an additional vowel [ɨ] or [ø] between ‘i’ and ‘u’, which may be represented as ‘ö’. A great majority of people in Taiwan can speak both Mandarin Chinese and Taiwanese although the degree of fluency varies widely. There are however small but significant numbers of people in Taiwan, mainly but not exclusively Hakka and Mainlanders, who cannot speak Taiwanese fluently. A shrinking percentage of the population, mainly people born before the 1950s, cannot speak Mandarin at all, though some of these speak Japanese fluently. Urban, working-class Hakkas as well as younger, southern-Taiwan Mainlanders tend to have better, even native-like fluency. Approximately half of the Hakka in Taiwan do speak Taiwanese. There are many families of mixed Hakka, Hoklo, and Aboriginal bloodlines. There is, however, a large percentage of people in Taiwan, regardless of their background, whose ability to understand Taiwanese is greater than their ability to speak it. Which variant is used depends strongly on the context, and in general people will use Mandarin in more formal situations and Taiwanese in more informal situations. Taiwanese tends to get used more in rural areas, while Mandarin is used more in urban settings. Older people tend to use Taiwanese, while younger people tend to use Mandarin. In the broadcast media, soap opera/dramas and variety shows tend to use Taiwanese, while game shows and documentaries tend to use Mandarin. Political news is broadcast in both Taiwanese and Mandarin. Taiwanese is also perceived by some to have a slight masculine leaning, making it more popular among the males of the younger population. It is sometimes perceived as “unladylike” when spoken by the females of the younger population. Pò͘-tē-hì, a form of puppetry, is part of the heritage transmitted in the Taiwanese tongue. Chhit-jī-á (literally, “that which has seven syllables”) is a poetic meter where each verse has 7 syllables. There is a special form of musical/dramatic performance koa-á-hì: the Taiwanese opera; the subject matter is usually a historical event. A similar form of puppetry, pò͘-tē-hì (“Taiwanese puppetry”), is also unique and has been elaborated in the past two decades into impressive televised spectacles. 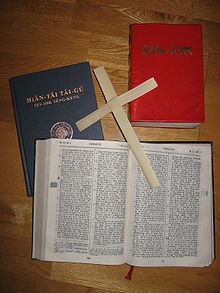 A collection of translations of the Bible in Taiwanese. Top left, Today’s Taiwanese version; top right, the Red-Cover Bible; bottom, Barclay’s translation. A copy of Barclay’s Amoy translation, opened to the Proverbs. 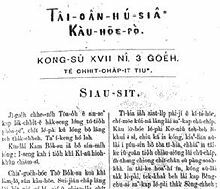 The next translation of the Bible in Taiwanese or Amoy was by the missionary to Taiwan, Thomas Barclay, carried out in Fujian and Taiwan. 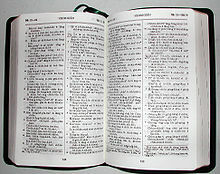 A New Testament translation was completed and published in 1916. The resulting work containing the Old and the New Testaments, in the pe̍h-ōe-jī orthography, was completed in 1930 and published in 1933 as the Sin-kū-iok ê Sèng-keng (Amoy Romanized Bible). This edition was later transliterated into Han characters and published as Sèng-keng Tâi-gí Hàn-jī Pún (聖經台語漢字本) in 1996. 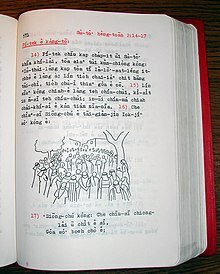 The Ko-Tân (Kerygma) Colloquial Taiwanese Version of the New Testament (Sin-iok) in pe̍h-ōe-jī, also known as the Red-Cover Bible (Âng-phoê Sèng-keng), was published in 1973 as an ecumenical effort between the Protestant Presbyterian Church in Taiwan and the Roman Catholic mission Maryknoll. This translation used a more modern vocabulary (somewhat influenced by Mandarin), and reflected the central Taiwan dialect, as the Maryknoll mission was based near Tâi-tiong. It was soon confiscated by the Kuomintang government (which objected to the use of Latin orthography) in 1975. A translation using the principle of functional equivalence, Hiān-tāi Tâi-gú Sin-iok Sèng-keng (Today’s Taiwanese Romanized Version), containing only the New Testament, again in pe̍h-ōe-jī, was published in 2008 as a collaboration between the Presbyterian Church in Taiwan and the Bible Society in Taiwan. A translation of the Old Testament, following the same principle, is being prepared. Until the 1980s, the use of Taiwanese, along with all dialects other than Mandarin, was discouraged by the Kuomintang through measures such as banning its use in schools and limiting the amount of Taiwanese broadcast on electronic media. These measures were removed by the 1990s, and Taiwanese became an emblem of localization. Mandarin remains the predominant language of education, although there is a “mother tongue” language requirement in Taiwanese schools which can be satisfied with student’s choice of mother-tongue: Taiwanese, Hakka, or aboriginal languages. Although the use of Taiwanese over Mandarin was historically part of the Taiwan independence movement, the linkage between politics and language is not as strong as it once was. Some fluency in Taiwanese is desirable for political office in Taiwan for both independence and unificationist politicians. At the same time even some supporters of Taiwan independence have played down its connection with Taiwanese language in order to gain the support of the Mainlanders and Hakka. James Soong restricted the use of Taiwanese and other local tongues in broadcasting while serving as Director of the Government Information Office earlier in his career, but later became one of the first Mainlander politicians to use Taiwanese in semi-formal occasions. Since then, politicians opposed to Taiwan independence have used it frequently in rallies even when they are not native speakers of the language and speak it badly. Conversely, politicians who have traditionally been identified with Taiwan independence have used Mandarin on formal occasions and semi-formal occasions such as press conferences. An example of the latter is former President Chen Shui-bian who uses Mandarin in all official state speeches, but uses mainly Taiwanese in political rallies and some informal state occasions such as New Year greetings. The current DPP chairwoman Tsai Ing-wen have been criticised by her supporters for not using Taiwanese in speeches. President Ma Ying-jeou spoke in Taiwanese during his 2008 Double Ten Day speech when he was talking about the state of the economy in Taiwan. In the early 21st century, there are few differences in language usage between the anti-independence leaning Pan-Blue Coalition and the independence leaning Pan-Green Coalition. Both tend to use Taiwanese at political rallies and sometimes in informal interviews and both tend to use Mandarin at formal press conferences and official state functions. Both also tend to use more Mandarin in northern Taiwan and more Taiwanese in southern Taiwan. However at official party gatherings (as opposed to both Mandarin-leaning state functions and Taiwanese-leaning party rallies), the DPP tends to use Taiwanese while KMT and PFP tend to use Mandarin. The Taiwan Solidarity Union, which advocates a strong line on Taiwan independence, tends to use Taiwanese even in formal press conferences. In speaking, politicians will frequently code switch. In writing, almost everyone uses vernacular Mandarin which is farther from Taiwanese, and the use of semi-alphabetic writing or even colloquial Taiwanese characters is rare. Despite these commonalities, there are still different attitudes toward the relationship between Taiwanese and Mandarin. In general, while supporters of Chinese reunification believe that all languages used on Taiwan should be respected, they tend to believe that Mandarin should have a preferred status as the common working language between different groups. Supporters of Taiwan independence tend to believe that either Taiwanese should be preferred or that no language should be preferred. In 2002, the Taiwan Solidarity Union, a party with about 10 % of the Legislative Yuan seats at the time, suggested making Taiwanese a second official language. This proposal encountered strong opposition not only from Mainlander groups but also from Hakka and aboriginal groups who felt that it would slight their home languages, as well as others including Hoklo who objected to the proposal on logistical grounds and on the grounds that it would increase ethnic tensions. Because of these objections, support for this measure is lukewarm among moderate Taiwan independence supporters, and the proposal did not pass. In 2003, there was a controversy when parts of the civil service examination for judges were written in characters used only in Taiwanese. After strong objections, these questions were not used in scoring. As with the official-language controversy, objections to the use of Taiwanese came not only from Mainlander groups, but also Hoklo, Hakka and aborigines. The Taiwanization developed in the 1990s into a ‘mother tongue movement’ aiming to save, preserve, and develop the local ethnic culture and language of Holo (Taiwanese Hokkien), Hakka, and aborigines. It started off from trying to save some declining languages and then flourishes in the 21st century. Besides preserving the best of Chinese culture in the world, Taiwan has since 1990s progressed towards a more multi-cultural society, with development of ethnic culture such as Holo, Hakka, and aborigines. In 1993, Taiwan became the first country in the world to implement the teaching of Taiwanese Hokkien in schools. By 2001, Taiwanese languages such as Taiwanese Hokkien, Hakka, and aborigines languages are taught in all schools of Taiwan. Taiwan also has its own literary circle whereby Hokkien poets and writers compose poetry and literature in Taiwanese Hokkien on a regular basis. This mother tongue movement is still ongoing. As a result of the mother tongue movement, Taiwan has emerged as a significant cultural hub for Hokkien in the world by the 21st century. It also plans to be the major export center for Hokkien culture worldwide in the 21st century. ^ “Ethnologue report for language code:nan”. Ethnologue.com. http://www.ethnologue.com/show_language.asp?code=nan. Retrieved 2009-02-19. ^ (in Mandarin, Min Nan) 國臺對照活用辭典 (Mandarin-Taiwanese Comparitive Living Dictionary), page 2691. ISBN 9573240882. ^ “本土聖經” (in traditional Chinese). http://www.biblesociety-tw.org/native.htm. Retrieved 2008-07-14. ^ “書評『聖經－－台語漢字本』” (in Japanese). http://www32.ocn.ne.jp/~sunliong/lunwen-12j.htm. Retrieved 2008-07-14. Ethnologue Report For Chinese Min-Nan (15th edition); Ethnologue Report For Chinese Min-Nan (14th edition). This report uses a classification which considers Taiwanese a dialect of Min-Nan, which is classified as a separate language from Mandarin. This view of Taiwanese is controversial for the political reasons mentioned above. Daiwanway: Tutorial, dictionary, and stories in Taiwanese. Uses a unique romanization system, different from Pe̍h-oē-jī. Includes sound files. The original appears to be offline (last checked 14 November 2007) but is available as a cached version via the Wayback Machine. Babuza Chu. Medical knowledge published in Taiwanese by Babuza.